This article will cover the standard UPS Shipping Boxes and will help you understand them better. 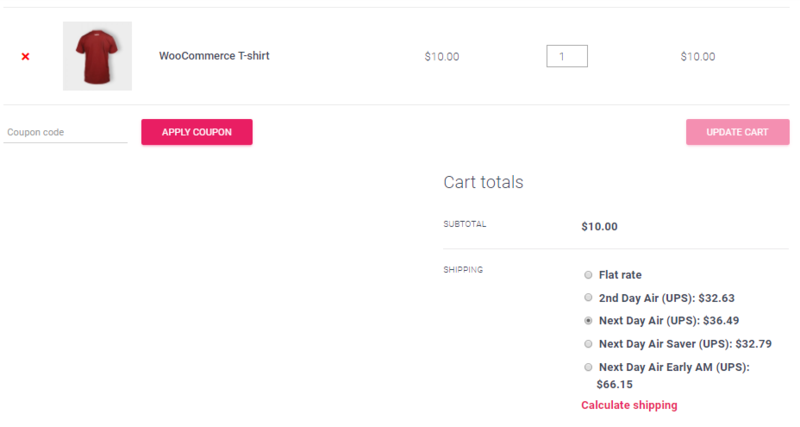 It will also cover various scenarios where WooCommerce store owners can use these boxes when using the WooCommerce UPS Shipping Plugin with Print Label. Read more below. When it comes to delivering packaging across domestic and international borders, the UPS Shipping services is one of the best that is available. Be it for online or offline business owners, UPS Shipping service provides hassle-free package delivery. With our WooCommerce UPS Shipping plugin, the idea has always been to provide all the amazing UPS shipping services to store owners, directly within the WooCommerce store. This plugin serves all the needs of store owners who are looking for the best shipping experience in WooCommerce. And undoubtedly, the most important and necessary facilities is the UPS live tracking feature. If you want to know about Custom UPS shipping boxes, you can click here. Now let us discuss the Standard UPS shipping boxes in detail provided in the plugin. By default, the following shipping boxes available in WooCommerce UPS Shipping plugin. Here we will discuss them in detail. Along with the specifications such as dimensions or weight limits, this article will also help store owners identify possible business cases where the above-mentioned shipping boxes can be used. The UPS Letter is suitable for urgent correspondence and documents delivery, especially through UPS Next Day Air, 2nd Day Air and International services. So it delivers both domestically as well as internationally. As far as the dimensions and weight limitations are concerned, UPS Letter is having 12.5″ x 9.5″ with a weight limit of 0.5 lbs. Some other order information based on UPS Letter include the number of parcels that should be there in a single order. UPS Letter packaging is valid for a minimum of 25 envelops in a single order. The increment is possible for 25 more units but if the order contains more than 250 parcels, the increment value varies. Legal documents are something which no one wants to fold. Moreover, you need a fast mode of shipping to deliver the legal documents. These documents can be easily shipped across the globe using UPS Letter shipping option. It serves as the cheapest as well as most appropriate packaging method for legal documents. UPS PAK is used for protecting shipments that need a 16″ x 13″ x 1″ (or local equivalent) container of tear-resistant material. It is mostly used when the shipment has to be shipped with Next Day Air, 2nd Day Air, Worldwide Express, and Worldwide Expedited services. Te dimensional limits for the packages shipped via UPS PAK is 17″ x 13″ x 1″. It is to be noted that the shipping cost that will be charged, will be based on the weight of the package. Also, in case of international shipping, all the export documentation is required in case you decide to pack your products in a UPS PAK. Here is a shipping scenario when you can choose to pack and ship your products in a UPS PAK. UPS PAK serves as the ideal solution if you want to ship gift cards to your customers. 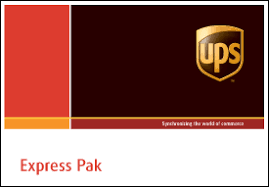 Moreover, in case you provide a certificate of purchase with the products, it will be best to use UPS PAK. The reason being, UPS PAK serves as the packing option which are flat and non-foldable or non-breakable. The triangular Tube packaging is useful for shipping those documents that do not need to be folded. These documents can be rolled instead, and inserted into the tube. The tube packaging requires export documentation if the shipment is international. Otherwise, it can also be shipped domestically or in the areas within the free circulation. The dimensions of tube packaging are about 38″x 6″ x 6″, with no weight limits. Further, no order details or increment quantity is available in case of the tube packaging. The hassle of shipping valuable paintings and other pieces of art is nothing less than a nightmare for the owners of online art galleries. While some of the paintings can be very valuable and delicate, and can not be folded or packed in the UPS Letter that we discussed above. In that case, rolling the paintings and shipping them across the globe seems the most appropriate option. In this way, more than one items can be shipped in one package as it does not take much space too. The UPS 10kg box is very useful for the Worldwide Express delivery using UPS. It is used to parcel documents across the countries and as the name suggests it can contain a package weighing not more than 10kg. Since this is an internationally shipped delivery box, it is mandatory to include export documentation with it. Moreover, the charges are calculated based on flat rate and the shipping zone. As far as the dimensions are concerned, the dimensions of this box are 16″ x 13″ x 10″, with the weight limit of 10kg. Besides, the order should contain the minimum of 2 such 10kg UPS boxes and the same goes for the increment. But the orders containing more than 5 boxes may have different increments. Shipping something like stationery items can’t always be achieved through the above-mentioned packages. Especially when it involves heavy items such as books or magazines. Moreover, these items need a more durable package than just a paper and plastic covering. Packing stationary items in the 10kg UPS box makes more sense as stationery items such as books, notebooks, paper sheets, magazines, etc. can be shipped in one go. And that too in a cheaper price and a much durable packaging. The UPS shipping also provides a bigger option to deliver orders to customers. The 25kg shipping package is suitable for those orders which exceed the minimum limit of 10kgs UPS box. And hence, instead of using two such boxes, store owners can pack the whole package in one bigger box. Just like the 10kg Box, this one too supports Worldwide Express delivery, with export documentation mandatory. Also, the charges are based on flat rate charges and shipping zones. The dimensions of this box are 19″ x 17″ x 14″, with the weight limit of 25kg. The minimum quantity based on a single order is again two boxes per order. But it may vary if the total package exceeds five such boxes. It is obvious that you have heard the name Amazon, and would have experienced their shipping. Not entirely an electronic store, but even Amazon ships their electronic products very comfortable in a box. As the weight limit is lesser in the above option, the 25kg UPS box suits well for an online electronic store. The electronic items require more protection as well as they need a packaging which supports higher weights. So they can be shipped ideally using these boxes. The UPS shipping boxes also have an Express Box option for domestic as well as international delivery. The Express Box ships through the Next Day Air, 2nd Day Air and many international services. Other than that, the Express Boxes are used for a wide range of shipping, which makes them very versatile. The shipping charges are calculated on the basis of the weight of the package or the shipping zone. When it comes to the dimensions of the Express Box, there are three options available. However, the weight limit is defined only on the large express box, which is 30 lbs (13 kg). Also, the minimum quantity of these boxes to be shipped is 20, for all sizes. When it comes to increments, the value remains 20 for normal increments for all three of them. But the increment value tends to vary after 40 large or medium boxes and 100 small express boxes. The WooCommerce UPS Shipping plugin provides the following option to select either one of the express boxes based on your needs and business case. Now you will see in which cases these boxes can prove to be helpful. Not every online store ships just internationally or domestically. Especially in case of shipping medicines, two things are there to be kept in focus, i. The shipping is both domestic as well as international, and ii. The batch varies in quantity. Shipping medicines using UPS Express Box packaging serves both these conditions. With options of large, small and medium packages, it can cope up with the quantity. And since the delivery is both domestic and international, the other condition is also satisfied. Hence it serves as the optimal option for delivery. So this was all about the standard UPS Shipping Boxes that are present in the WooCommerce UPS Shipping plugin. Now let us try to configure a scenario using UPS Shipping plugin where a packaging option, should be automatically selected for a customer. and it weighs O.o1 lbs. Further, the store owner had all the boxes selected in the WooCommerce UPS Shipping plugin settings. Now, based on the product dimensions, the plugin should be able to show the customer, the prices for that UPS box, which is well suited for shipping. So let’s see what happens when the customer places the order. The customer wants the order to be shipped domestically. Hence, all the domestic delivery options are visible with their respective delivery charges. So the customer chose Next Day Air(UPS) and placed the order. As soon as the customer places the order the package is automatically generated based on the dimension, weight limits and the type of shipping service selected by the customer. As we discussed earlier, the package that is generated in this case has the dimensions that are shown in this image above, i.e. 13″ x 11″ x 2″. This suggests that Small UPS Express Box is automatically selected for shipping this customer’s order which has a dimension of 10″ X 8″ X 1″. 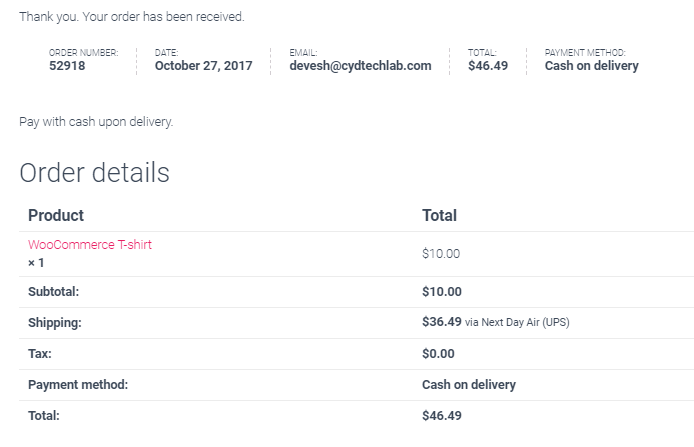 Hence, this way, a store owner can use the WooCommerce UPS Shipping plugin to automatically select the packaging method from the store. We also discussed that if the store owner’s business case demands more flexibility in terms of packaging options in UPS, they can opt for custom boxes. This will not only reduce the wastage but it will also help decrease the shipping cost drastically in some cases. If you have any further queries related to WooCommerce UPS shipping plugin or the shipping box options, feel free to share in the comment section. We will be delighted to help you.